Imagine a trio of UC Berkeley-trained journalists hunkered down in a cramped studio, mixing it up with campus experts and spinning real-world scientific-adventure tales brimming with wide-eyed wonder. Imagine the Bobbsey Twins as media-savvy science nerds, virtually joined at the hips to a radio pro, all of them bearing bachelor’s degrees from Yale, Scripps or UC Santa Barbara and a master’s from Berkeley. Better yet, tune in and see with your own ears. 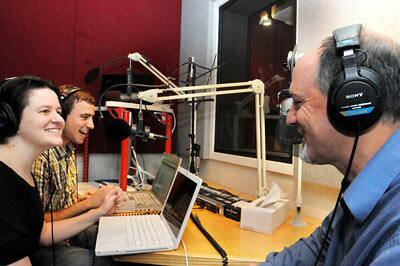 Early adopters know the scenario above as the “Field Trip Podcast” — “science without the lab, radio without the airwaves” — a campus-centric collaboration of author/reporters Kara Platoni and Eric Simons, their listeners’ guides and proxies, and Casey Miner, a producer with NPR affiliate KALW in San Francisco. In case you missed them, the intrepid group’s first outings, to destinations spanning the oceans and outer space, are archived on the “Field Trip” website and downloadable free via iTunes. Now nearing the launch of its second season, what’s become a labor of love — and, to be clear, the rewards are purely intangible — began as a gleam in the eye of Platoni, a space and technology buff who once covered the science front for the East Bay Express. A new season of “Field Trip Podcast” launches May 14. Meanwhile, here’s a taste. The project has no formal ties to Berkeley’s Graduate School of Journalism, but brims with its DNA. Platoni graduated in 1999, Simons in 2008; both returned in 2009 to teach and help run the school’s hyperlocal-news program. Miner, who graduated in 2010, was their student. 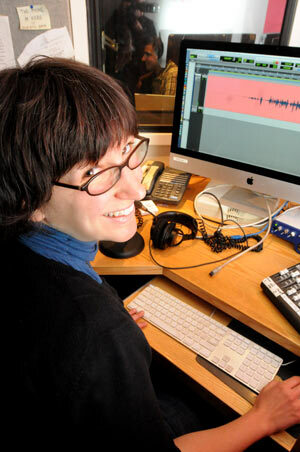 The podcasts themselves — eight in all, the second four slated to air in May and June — are recorded in the J-School’s basement studio, where, on a given morning, investigative reporter Lowell Bergman might be tweaking a Frontline episode. Students provide engineering help. Besides the J-School, the three have worked together in sundry combinations and capacities at the alt-weekly Express, the now-defunct Terrain magazine and a handful of other venues. And while their interests may vary — Simons’ thing for fish, for example, is his thing alone — they share an easy personal chemistry and insatiable curiosity about science, a category that, for them, embraces multitudes. And, like curious kids of any age, they’re crazy for field trips. To explore the nature of fire, they braved a portable trailer where the Oakland Fire Department practices putting out 500-degree blazes triggered via remote control. “When they said, basically, ‘Get inside this small box, and we’re going to close the door and set it on fire’ — you know, that was a little intense,” Platoni admits. Post-adventure, in the cozier confines of the J-School, the episode takes its shape. For an upcoming episode on telescopes, Platoni and Simons spoke with Berkeley astronomer and “planet hunter” Geoff Marcy. (They found the interview “hilarious”; Marcy, hunting for an adjective, pronounced it “gripping.”) Together the team writes a script, which Platoni and Simons revise as they record, and Miner turns it all into Internet-era radio. The first season had the team exploring Mars, oceans, fire and fermentation. Scheduled for May are looks at coffee, telescopes, taxidermy and inventors. Their ability to merge serious science reporting with childlike wonder may have something to do with the fact that the project itself is, like any given episode, an adventure. There are no paychecks, no contracts, no editors or program directors. Nor are episodes constrained by a specified length, though most run from 25 to 30 minutes. And, they hope, fellow science nerds and adventurers of all ages. The second season of the “Field Trip Podcast” is set to begin May 14, with new episodes every Monday through June 4. For updates and further information, visit the program’s website or Facebook page.